May Day celebrations, wide and varied fun.... All information below found at Wikipedia. Celebrations among the younger generations take place on May Day Eve, see Walpurgis Night in Finland, most prominent being the afternoon 'crowning' of statues in towns around the country with a student cap. In rural regions of Germany, especially the Harz Mountains, Walpurgisnacht celebrations of pagan origin are traditionally held on the night before May Day, including bonfires and the wrapping of a Maibaum (maypole). Young people use this opportunity to party, while the day itself is used by many families to get some fresh air. Motto: "Tanz in den Mai!" ("Dance into May!"). 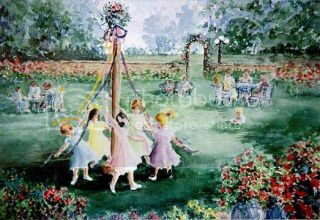 In the Rhineland, May 1 is also celebrated by the delivery of a maypole, a tree covered in streamers to the house of a girl the night before. The tree is typically from a love interest, though a tree wrapped only in white streamers is a sign of dislike. Females usually place roses or rice in form of a heart at the house of their beloved one. It is common to stick the heart to a window or place it in front of the doormat. On leap years, it is the responsibility of the females to place the maypole. All the action is usually done secretly and it is an individual's choice whether to give a hint of their identity or stay anonymous. May Day was not established as a public holiday until 1933. In St Andrews, some of the students gather on the beach late on April 30 and run into the North Sea at sunrise on May Day, occasionally naked. This is accompanied by torchlit processions and much elated celebration. Happy May Day where ever you are! A dip in the sea sounds really good right now. After the storms, it's heated up and the muggies have set in.